When I first began exploring the iPad I was thrilled to learn that iBooks allows students to write notes and highlight things. Now they could have virtual post-it’s! What was even more exciting to me was that they could e-mail me these comments to me. 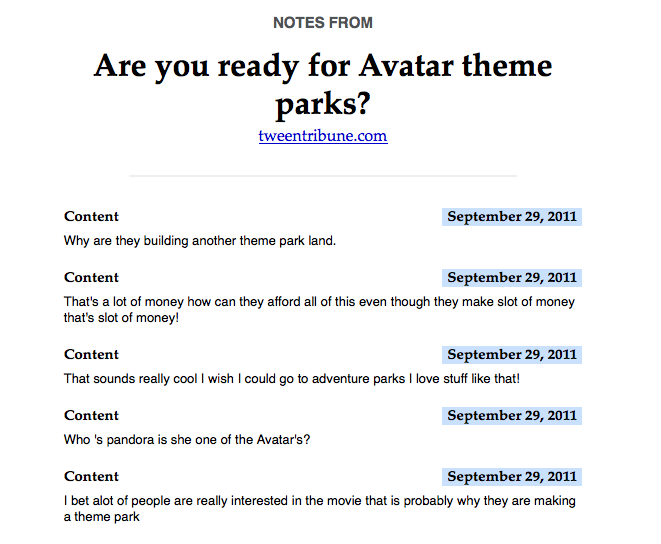 Here’s an example of what one of these comment pages might look like. As you can see the comments come up, but not the text that the student is referring to. This can be fixed if the student highlights the sentence or phrase that inspired that thought. This is what I plan on teaching my students next. I think that it will be very powerful for them to articulate specific words or phrases that have triggered their thinking. I find this format really revealing and easy to look at as well as assess. I have enough rag tag stacks of paper and this document is a quick assessment glance at the thinking my student did during the day’s lesson. I also think that when these comments are listed out like this it makes it easy to look for patterns in thinking. In the example above I see the student is demonstrating an emotional connection with the text, they are questioning, and they are linking to their background knowledge. The comment about Pandora reveals that the student is probably connecting to their background knowledge of the mythological person Pandora and when the article refers to Pandora as a place he is attempting to reconcile this information. This would be my opening point in a conference about the text. Well, the catch is that this only works with iBooks that you purchase…which I have no money for, and ePUBs. The good news is that there is a way to turn any internet article into an ePUB for students to use. Thanks to Bruce “Awesomeness” Ahlborn for this tip. dotEPUB is a site that will do this dirty work for you. All you have to do is install their bookmarklet on your computer or iPad and a few simple clicks will send the article to your device. Bam! Presto! Any internet article becomes a tool for practicing active literacy. This entry was posted in Active Literacy, iPad, Reader's Workshop, Technology and tagged active literacy, epubs, ibooks, reader's workshop, writing, writing about reading. Bookmark the permalink. Thanks for this tip. I think it will be so useful in my Grade 2 classroom for my experienced readers who can decode well, but who are yet to develop deep thinking about what they read. This is such a simple tip, but like so many others shared online, it’s an “aha!” moment when it is shown so simply with classroom examples.